Akebia plant growing vine of the genus Akebia also known as Chocolate vine, Akebia plant perennial evergreen or deciduous plant in cold climate, fruits edible but mostly used as ornamental fragrant plant and as hedge plant, can grow in temperate, subtropical, mediterranean climate or as houseplant and growing in hardiness zone 4-9. Flower fragrant color can be: purple, pink, white or red with 3 petals. Fruits edible, peel color purple, the inner part is white. 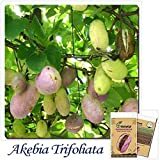 Akebia quinata CHOCOLATE VINE Seeds! 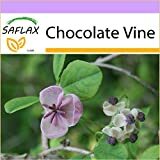 10 Seeds Akebia Quinata Seeds- Chocolate Vine, Raisin Vine, Five-leafed Akebia !